The founder of Collamin Design is the Certified jewellery designer Helena Sjölin. Helena Sjölin is 24 years and from Sweden. She has always had the passion for the creative arts and making her own unique creations. When Helena finished high school she moved with her father to Singapore. One day she stumbled over the bead shop “Bead hub” in the midst of the shopping district in the Orchard road area in Singapore. 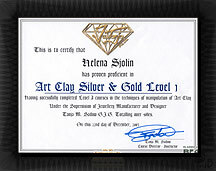 There she obtained her first diploma in “the art of creating Jewellery” which was then followed by diplomas in basic and advanced Art clay silver making. These courses were all taught by Jewellery manufacturer and Designer Tanja M. Sadow G.J.G who has been a big inspiration and role model for Helena. Helena travels all over the world to collect materials and inspiration for her unique creations. With her creations Helena wants to express her view of the world we are living in. Collamin Design has satisfied costumers all over the world. The different jewellery collections are to be found at Salong Christina in Norrköping Sweden and available on order through this site. I was amazed by the efficiency and effort that was made to create the necklace I had pictured but not been able to find anywhere. A great necklace, of great quality and at a very fair price.